Diecutting Supplies – Nicking Tools – AmeriKen Online! The 110 volt, 1/10th HP motor is standard and an optional 110 volt, 1/8th HP variable speed motor is available. A 3ft flex shaft is standard with an optional 5ft or 6ft length. 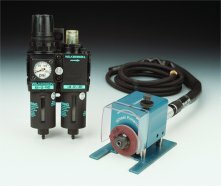 The pneumatic QuickNick comes with a regulator and 5ft distribution hose. Other hose lengths available. Each grinder comes with 13 grinding wheels for controlled nick widths. Sizes include .006, .008, .012, .016, .020, .025, .031, .047, .063, .078, .094, .109, and .125. AmeriKen also carries low cost hand and air grinders. Call for pricing and availability. Grinding wheels are available in rubber bonded, thin, medium, thick and extra thick reinforced and diamond. Call for sizes and availability.